Hi guys! I thought I’d do something a little different this week as I’m feeling a bit physically run down and wanted to write something nice and positive. So, I’ve decided to look back at some of my old posts and talk about which products are my favourites, still use, any changed thoughts and any other posts I’d love for you to read. I’m going to look back at what I think is one of the best lipsticks of all time, a fab supplement to battle weak nails, lifeless hair and bad skin, a mascara that gives insane volume and more. See this as the perfect Sunday evening blog-read-athon post. Get yourself a cup of tea, cuddle up under a blanket and lets get reading! Hey guys! I know how much you all love Avon posts here on the blog. They’re consistently my most popular posts, especially lip product related ones. So I’m back today with a post about the new Avon lip release: the Avon True Nourishing Lip Oil. 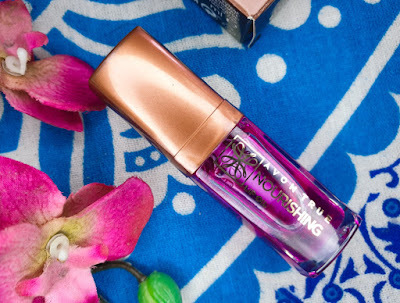 The Avon True Nourishing Lip Oil is a non-sticky, nourishing oil (clue is in the name) that has a SPF12, a glossy finish and a tint of colour. It promises to lock in 3 times more moisture and it is enriched with jojoba, avocado and coconut oils alongside Vitamin E.
It comes in two shades; Blossom/a pink tint and Shimmering Pearl/subtle shimmer. I have the shade blossom to show you today. It comes packaged in a clear, plastic bottle with a plastic rose gold coloured screw cap lid that has a wand applicator inside. It holds 7ml of oil. The bottle then comes in a copper-rose gold coloured box. Blemish free, youthful, smooth, hydrated, glowing skin. We all want it, right? That’s precisely why the skincare industry is so big. So within a sea of products claiming to be your one magic cure it can be very difficult to navigate your way to something that works. Enter us lowly beauty bloggers to be your personal guinea pigs and we bring you posts like I’m bringing you today. That’s right, I’m here reviewing a serum that promises all the above. 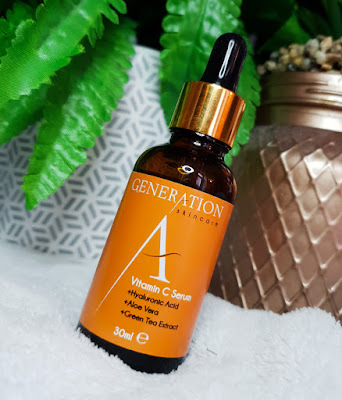 The Generation Skincare Vitamin C Serum is a lightweight, all-natural serum that contains Vitamins B, C and E, Aloe Vera (which itself is rich in Vitamins C and E), Green Tea and hyaluronic acid. We all know how good Vitamin C is for our health, but how good can it be for our skin? Vitamin C helps to rejuvenate the skin and to fight signs of ageing before they begin. On top of that it promotes the production of collagen and helps with redness and inflammation. Alongside the Vitamin C, hyaluronic acid works to retain water and to keep the skin super hydrated. The addition of Vitamin E is great for acne scarring as I’ve mentioned before in previous posts as well as tissue repair whilst the Vitamin B improves elasticity, eases redness and irritations and nourishes. Aloe Vera is well-known to be soothing as well as moisturising and Green Tea is good for detoxifying and is anti-inflammatory. The Generation Skincare Vitamin C Serum is not tested on animals. It comes packaged in a 30ml dark orange/brown tinted glass bottle which is ideal to help prevent the product from spoiling quickly. It has an orange sticker on the bottle with product information and the screw cap lid contains a pipette dropper for application.